Carnotaurus was a carnivore (meat-eater) that lived in South America (its fossils have been found in Patagonia, Argentina) during the late Cretaceous period, about 70 million years ago. Carnotaurus was about 30 feet (9 meters) long, and stood about 10 feet (3 meters) tall at the hips. It weighed around 2 tons. The most noteworthy feature of Carnotaurus are the thick horns above the eyes, it is from these it gets its name, which means "flesh bull" (it is a meat-eater, and the horns are said to resemble those of a bull). It had a robust (but small) skull, but a slender low jaw bone. Its eyes, unusually for a dinosaur, faced forward. Scientists think that this may mean it had binocular vision and depth perception. It had a relatively long neck as compared to other Theropod dinosaurs. It had extremely reduced front limbs, each of which ended in a four-fingered hand. Although only one near-complete skeleton of Carnotaurus has been so far (at the time of writing this article), this skeleton was accompanied by fossilized skin impressions. From these, we know that Carnotaurus did not have feathers (unlike some other advanced Theropod dinosaurs), but the animals skin was lined with rows of bumps, the bumps growing larger nearer the animal's spine. It is not entirely clear what the purpose of these bumps would have been. South American Dinosaurs - Carnotaurus lived in South America. Carnotaurus was a genus of dinosaur. 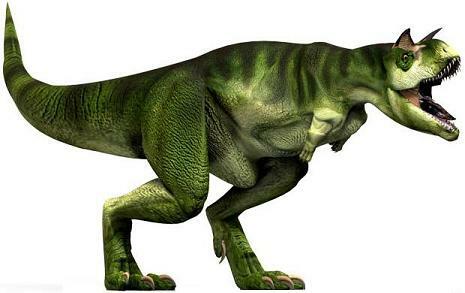 "Carnotaurus" means "flesh bull" (because it was a meat-eater and had horns resembling those of a bull). Carnotaurus was a member of the Saurischia ("lizard-hipped") order of dinosaurs. What this means, is that although Carnotaurus was not closely related to lizards, it did have similarly shaped pelvic bones. Carnotaurus was a Theropod - a member of a group of related bipedal dinosaurs that included the ancestors of birds (although Carnotaurus was not itself an ancestor of birds). Carnotaurus lived about 70 million years ago, during the late Cretaceous period. Carnotaurus lived in South America. Carnotaurus was a carnivore (meat-eater). Carnotaurus was about 30 feet (9 meters) long, and was about 10 feet (3 meters) tall at the hips. Carnotaurus weighed around 2 tons. Odd meat-eaters like Carnotaurus were quick and deadly hunters. They had sharp teeth, good eyesight, and could run on two strong legs. Bold, full-color illustrations, easy-to-read charts and maps, and interesting facts take readers back to a time when these odd meat-eaters walked the earth. Eine internationale Gruppe von Dinosaurierforschern bricht auf zu einer Grabungsexpedition in den Weiten der patagonischen Wildnis. Als Ben, dem Sohn des Grabungsleiters, durch Zufall mit dem fast vollständigen Skelett eines Carnotaurus sastrei, eines mittelgroßen Raubsauriers, ein Sensationsfund gelingt, ahnt er noch nicht, dass dies nicht nur für ihn das Abenteuer seines Lebens werden wird. Sein Vater erzählt ihm und den anderen Expeditionsmitgliedern an den allabendlichen Lagerfeuern die Lebensgeschichte dieses so beeindruckenden Tieres, wie sie sich vielleicht einmal abgespielt haben könnte. Ben erkennt schnell, dass auch ein Raubtier, das fast an der Spitze der Nahrungskette stand, jeden Tag aufs Neue um sein Überleben kämpfen musste. Provides information about how the carnotaurus, a fierce crested predator living in Argentina during the Cretaceous period, may have looked and behaved. Carnotaurus And Creatures From The Killing Valley is the Sci-Fi Story about Carnotaurus the most bizarre yet dangerous meat eating dinosaurs ever found and people in the Future World Park. Describes the physical characteristics, habitat, and behavior of a big, heavy dinosaur with two horns on its head. Carnotaurus Squad: For writing dinosaur stories and tall tales about all things prehistoric. A blank-lined journal to fill with all kinds of adventurous tales about dinosaurs, fossil-hunters, and any kind of prehistoric stories. Perfect for a stocking-filler to those who are passionate about these great lizards. 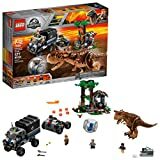 - Cover inscription - "Carnotaurus Squad"
Flee the flying lava rocks and a deadly dinosaur on Isla Nublar, with this dramatic LEGO Jurassic World 75929 Carnotaurus Gyrosphere Escape play set. Help Owen, Claire and Franklin make their escape in the Gyrosphere or truck, featuring a 2-seater cab with sunroof, stud shooter, mobile control center and Gyrosphere trailer with launch function. The overgrown Gyrosphere station has an exploding lava rocks function, Gyrosphere launcher and a dinosaur nest. 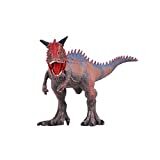 This fun toy includes 3 minifigures and a Carnotaurus dinosaur figure. 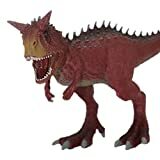 Schleich's carnotaurus is red and purple as well as a true Reflection of nature on a smaller scale. A carnotaurus is a typical example of a carnivorous predatory dinosaur. He ran on strong hind limbs and had a jaw full of sharp, long teeth. This figure is unparalleled in attention to realistic scaling and detail. It is made of high quality vinyl plastic and hand painted. The measurements are 8.5" x 2.4" x 4.1". 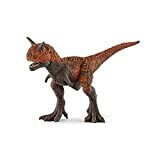 Makes a great addition to your Schleich dinosaur collection! Decorate your dinosaur-themed party with this Carnotaurus! Centaurus is a carnivorous predatory dinosaur from the upper Cretaceous. It lived approximately 70 million years ago. The only specimen ever found was excavated in Argentina. The Centaurus had a length of 9 meters and an estimated weight of 1.5 to 2 tons. His jaw was more rounded than that of his relatives, and his teeth looked like bended knife blades. Surely it was one of the most dangerous predators of its time. Size: 8.7"x2.8"x6.3". The dinosaur figures toy will be a good gift idea. A true reflection of nature on this smaller dinosaur toys scale, unparalleled attention to realistic detailing. After your work, play dinosaur toys with your kids, enjoy fun and warm parent-child time. Every boy has a dream of adventure in ancient times.It has been a fashion trend to take a dinosaur figure home. Open your door to the new world and enjoy it. The lifelike dinosaur will be a great Gift idea. Size: 8.7"x2.8"x6.3"
Ideal for presents,decorations or kids learning games. 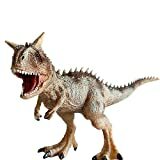 With realistic designs, children are able to experience and learn about the wide variety of nature from this Carnotaurus figurines. The dinosaurs flourished in the 230 million years ago. But Dinosaurs suddenly disappeared in 65 million years ago by the end of the Cretaceous. Still a mystery in the history of the evolution of the earth, this mystery is still no conclusion. Dinosaurs only remain in fossils. In the Mesozoic strata, many dinosaur fossils have been found. 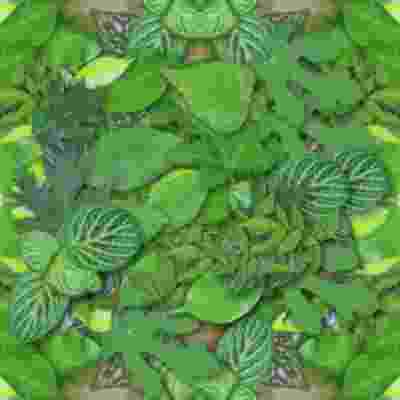 Which can be seen in a large number of or a variety of shapes of the bones. Dinosaurs, and body shape and habits are also large differences, there are meek herbivorous and violent meat eaters. These realistic models of dinosaur toys based on today's high-tech archaeological research. Take you back to the ancient world, have a glimpse of the appearance of dinosaurs. Great gift idea for kids. Carnotaurus is a carnivorous predatory dinosaur from the Upper Cretaceous. It lived approximately 70 million years ago. The only specimen ever found was excavated in Argentina. The Carnotaurus had a length of 9 meters and an estimated weight of 1.5 to 2 tons. His jaw was more rounded than that of his relatives, and his teeth looked like bended knife blades. Surely it was one of the most dangerous predators of its time. DINOSURE GIFT: A great gift for kids, ABS Plastic Material. Size: 11 * 6.7in (L * H). DOUBLE FUN:According to your idea, freely combine the parts to make it be a new dinosaur. PACKAGING & AFTER-SALES - 1 Large size dinosaur bricks come with sealed bag.To prove how confident we are in our product, we offer a lifetime money back guarantee with every purchase! If you are not completely satisfied with your dinosaur figures, we will refund your purchase with no exception! The Dinosaur building bricks are On Sale for a Limited Time Only! Click the Add to Cart Button Now! Kids playing time will take on a whole new meaning with the Honneth toy dinosaur figure set. Moms and Dads love Building Bricks because they are educational toys!Children can improve their logical thinking and hands-on ability when they are having fun. Children not only love building blocks,but also love dinosaur!We believe this dinos building blocks are a big surprise for them. Each dinosaur made of ABS plastic and the surface is smooth without rough.We inspect them repeatedly before sale,as we want to ensure the children using our toys is kept safe! The Honneth toy dinosaur blocks ideal for children's toy collections.Superb for kids rewards, STEM education or birthday party. To prove how confident we are in our product, we offer a lifetime money back guarantee with every purchase! If you are not completely satisfied with your dinosaur figures, we will refund your purchase with no exception! UNIQUE CREATURE: One of the most unique Theropod dinosaurs ever discovered, Carnotaurus had many features that make it unlike any other dinosaur, including its unusually deep skull topped with two short, spiky horns. This meat eater lived around 70 million years ago in what is now Argentina. PRODUCT SPECIFICATIONS: This figure measures nearly 11 inches long and is 4 inches tall. It's about as long as a standard American ruler. The Carnotaurus's body is a drab green with a dark brown reticulated pattern and a darker brown stripe along its back. Its head is orange and its feet are gray. One of the most unique Theropod dinosaurs ever discovered, Carnotaurus had many features that make it unlike any other dinosaur, including its unusually deep skull topped with two short, spiky horns. This meat eater lived around 70 million years ago in what is now Argentina. Carnotaurus is one of the few Theropods found with well preserved skin impressions that give us a better idea of how the dinosaur looked in life. At least part of its body was covered in raised knobby "scutes" that may have served to protect Carnotaurus as they engaged in combat with each other, perhaps to impress a mate. Like all Safari Ltd products, this figurine has been individually hand painted, features quality construction from phthalate and lead-free materials, and includes an educational hangtag in 5 languages. Realistic, educational, and fun, this figurine is suitable for a range of interests, including collectors, enthusiasts, teachers, and kids. Admire it on a shelf, use it in the classroom, or simply enjoy playing with it. This figure measures nearly 11 inches long and is 4 inches tall. It's about as long as a standard American ruler. The Carnotaurus's body is a drab green with a dark brown reticulated pattern and a darker brown stripe along its back. Its head is orange and its feet are gray. 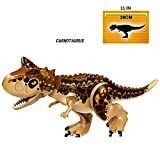 Carnotaurus is a carnivorous predatory dinosaur from the Upper Cretaceous. It lived approximately 70 million years ago. The only specimen ever found was excavated in Argentina. The Carnotaurus had a length of 9 meters and an estimated weight of 1.5 to 2 tons. His jaw was more rounded than that of his relatives, and his teeth looked like bended knife blades.